EA Access: The Next Step for Digital Distribution in Console Gaming? 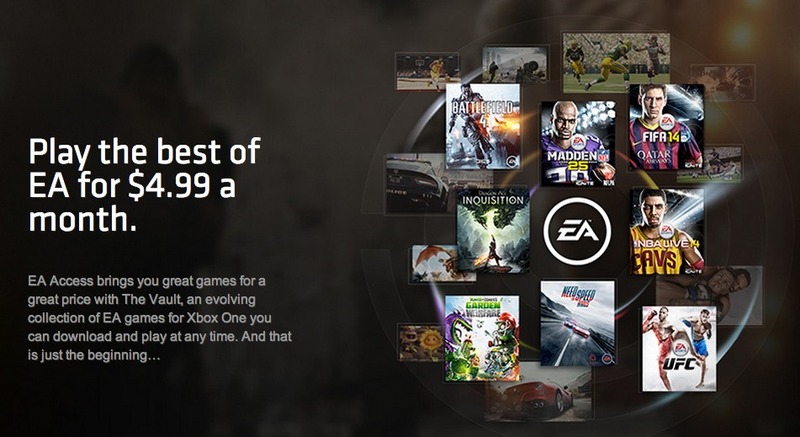 Today EA announced a new subscription service called “EA Access,” exclusively for Xbox One. For $4.99 a month or $29.99 a year users will gain unlimited access to “The Vault” which will contain numerous full EA games. 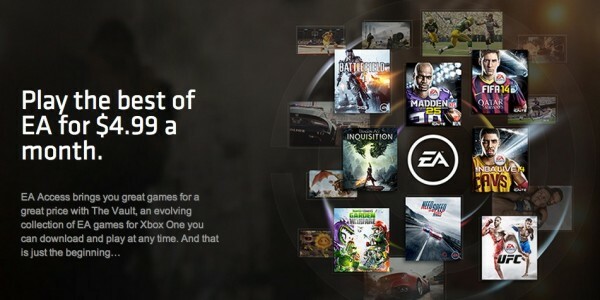 We don’t know yet exactly which games you’ll be able to get your hands on when the service launches in earnest, but EA have announced that FIFA '14, Madden NFL 25, Peggle 2 and Battlefield 4 will all be available in the EA Access beta. There will also be additional perks alongside this such as discounts on digital EA games and services as well as exclusive pre-release trials of upcoming EA releases. They haven’t announced specific dates for the beta or full release but did mention that it would be “soon” so I presume we’ll hear something on this before the big rush of games during the holidays. I’m sure you’ll agree that this announcement is huge, especially coming from a company as big as EA. $4.99 would be a ridiculously cheap price to pay for any one of those games on their own but when bundled together into one package the price proposition is just too good to turn down, even if you only have the most meager of interest in them. Given the games they've announced so far and their aim to offer discounts on new releases its safe to assume there will be some sort of time buffer before games become available through Access. Meaning you won't be able to pay $4.99 and get the new Madden the day it comes out, which is understandable. Still though, even for games that are a few months old that’s no price to sniff at. So, what does EA get out of offering such a good deal? Well, it is hard to tell what their intentions are for the service this early on. To me though this whole announcement reads as a pretty clear shot across the bow at retail games sales. Take a game like the upcoming FIFA '15 for instance. Some people might be tempted to wait and buy it secondhand from Gamestop or in some sort of Black Friday Best Buy deal. Now though EA is jumping in front of the retailers and giving you the option to buy it directly from them for a much more attractive price. It’s also worth noting that at the end of their announcement EA mentions that you’ll be able to buy EA Access memberships from retail stores and Amazon. Shows that even as they’re attempting to detach themselves from retail they still have to make some concessions towards it. A reminder that not everyone has quite yet embraced the ‘digital future’ that EA more than ever seems to be striving for. As for downsides to this service from a player perspective there doesn’t appear to be many right now. Obviously you’re only paying for the right to play these games, you don’t actually own them outright. That might irk some people who worry about digital rights but for them there’s always the option to just buy the game. There’s also the possibility that due to the online-focused nature of the service EA might be incentivized to hold onto certain narrative-driven games a little longer before making them available. With a multiplayer-focused franchise like Battlefield it is easier to keep people hooked for months at a time whereas you could complete something like Mass Effect in a week and then just unsubscribe. But I’m just speculating. The fact that EA is partnering with Microsoft and the Xbox One specifically is a little odd but not too surprising. With a service as risky as this EA will want to start small. This way they get to test the waters on one platform and if it ends up working out then they are free to expand to others from there. The Xbox One DRM policies they scrapped prior to its release show Microsoft is willing to experiment with new ideas for digital distribution, even if the response is less than warm. So in that respect it is a sensible choice. I’m sure it won't be exclusive for long though. I’ll admit, while I’m not as cynical about EA as some are I am a little suspicious as to why they of all people are the first ones to come forward with a service as accommodating as EA access appears to be. It seems out of character for them but maybe that’s the point. God knows they’ve had an image problem lately and this announcement might go a long way to helping improve it a bit. But if this thing takes off and prompts EA’s peers to look into offering something similar then the next few years could be very exciting indeed.